Sometimes I find myself thinking so much about what poetry is or what it can do that I forget to think about how it can make me feel. Perhaps that is the sign of a lesser poetry, a poetry with holes in it: one that goes through the motions, the mechanics, of writing, but drives forward without an emotional core. The best poetry, though, leaves me feeling a little raw, a little open, a little more real. And sometimes that feeling comes by way of sadness or joy, but sometimes it is at its most memorable when it comes by way of awareness: awareness of the mind, of nature, and of the body. This is where Sandra Marchetti’s collection, Confluence, leaves me: with an awareness of the body, a clarity of mind, a reconnecting to nature. Marchetti’s poetry demands it, and hers is a poetry that leaves me happy to oblige. skid to the river in blinking beats. memories of church windows, a glacial past. bags beneath drift, seek their currents like fish. spine—a blind grasp toward glinting. silence and veins and skin—a globe, a missive. Two of the three poems I have included here involve birds, and obviously not all of Marchetti’s poems do—but it’s the beauty, the migratory patterns, and the mindfulness that Marchetti instills in and observes in these birds that teaches me so much about this world she’s created through these poems. What I love so much about this collection is its involvement in what was and what could be: old and classic traditions of poetry and poetic form, where Marchetti grew up, and that age-old idea that we can never go home again, unchanged or without consequence. This concept continues to be of great interest to us, because at some point, we always have to leave something we are connected to—home, a relationship, a workplace, a tree pulled up at the root—and we desire to return to that thing we’ve left. Even the concept of migration is not immune to this: though these birds may fly out and reappear in the same place, these occurrences are months apart, and things will have changed—something as large as the changing of the landscape, a building constructed, or something as small as an onlooker who observes the sky at once full and empty of birds. This concept of mortality of place is a recurring one in Marchetti’s work, and it is handled well—so well, in fact, that despite its darker truths, I am comforted in the knowledge that I can relate. And perhaps why this is all at once such an appealing and vexing concept is because of how Marchetti portrays her personal investments, and reminds us of our own. Through our connections to nature, where we grew up, and our loved ones (and even entertainment venues, like a favorite movie theater or ball park), we grow invested, which means we inevitably have something we could lose, or one day have to leave behind. 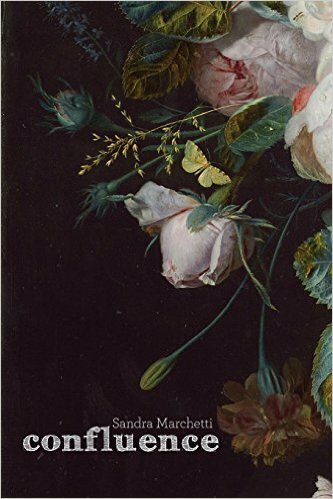 These poems are aware of the body and nature, and recall the domestic and the pastoral we observe in the classics. These connections to the past leave us feeling nostalgic and lead us to think about those things specific to our lives that keep us nostalgic, that make us call into our own pasts for the things we lost or had to leave behind. These concepts of leaving and missing home or a relationship or a place are hardly new, and many of us experience these phenomena often. However, these themes continue to work in Marchetti’s poems because of her employment of the writing as a reflection of the emotional core. By writing about past memories and places, we are encouraged to think of our own memories; and by using forms reminiscent of formal poetry, we are encouraged to think of where we have been as a larger (literary) community. And perhaps this is only me, but the involvement of these forms, or echoes of forms, make these memories all the more resonant. Perhaps it is the way that sound and rhythm impact us: the sounds in these poems, and their rhythms, lead us to read these poems at varied paces, cause us to pause, challenge us to hold our breath, take a breath; and this kinesthetic relationship impacts us emotionally. Reading “The Language of Ice” with its rhythm that is almost observant of rap, excites me, and makes me think of the choppy, sharp edges of ice; while reading a poem like “Skyward,” with its recurring s-sounds, makes me read the poem more slowly, making me think of the slow and easy passage of birds across an icy surface, across the sky, and their slow disappearance, so slow sometimes that I begin to question if they really were there at all. Sandra Marchetti has produced a really beautiful, and careful, collection that observes beauty, nature, and the body in a way that is thorough, alert, but unapologetic, honest and open. This is a strong deviation away from the old forms that I really admire: her ability to invite the sexual, entertainment, and pop culture, into her poems, while still employing careful images, rhythms, and sounds (as well as some internal and end-rhymes). If you haven’t already rushed out to read this collection, find the time to slow down and read this one, and give yourself the time to read it slowly. The images and the line-work deserve it. SANDRA MARCHETTI is the author of Confluence, a debut full-length collection of poetry from Sundress Publications, and a co-author of Heart Radicals, with Les Kay, Allie Marini, and Janeen Rastall. Eating Dog Press published an illustrated letterpress edition of her essays and poetry, A Detail in the Landscape; and her first volume, The Canopy, won Midwest Writing Center’s Mississippi Valley Chapbook Contest. Sandy won Second Prize in Prick of the Spindle’s 2014 Poetry Open, and her work appears in The Hollins Critic, Sugar House Review, Ecotone, Green Mountains Review, Blackbird, Southwest Review, and elsewhere. She is a Lecturer in Interdisciplinary Studies at Aurora University, outside of her hometown of Chicago.